We are a family run business based in Redditch, Worcestershire specialising in the refurbishment of bathrooms and kitchens. We strive to provide all our clients with a high standard of service, workmanship and finish at a competitive price. Supply and fit or fit only, the choice is yours! 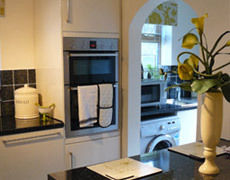 We can supply a large range of quality kitchens and bathroom suites to suit most budgets. 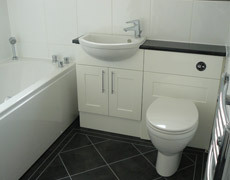 Full installation completed by us including plumbing, tiling, electrics and final decoration. Reliable, conscientious, trustworthy and friendly work force. By working closely with our suppliers, Howdens Joinery and Magnet Trade, we can offer clients a full design service including detailed CAD drawings of design options. Howdens Joinery and Magnet Trade are large national companies which have showrooms and warehouse facilities locally so that clients are able to see for themselves the full range and quality of the products we are offering. Whatever your budget we can supply a quality fitted kitchen fully project managed and completed by ourselves or install one you have purchased yourself from another supplier. We will supply fully qualified Gas and Electrical engineers to connect those all important appliances in a safe manner and to current gas and electrical requirements. We can also complete various floor finishes, tiling and decoration to your requirements. From whirlpool baths and shower units through to extractor fans, towel rails and under floor heating, we aim to provide you with a quality bathroom or en-suite, completed and project managed by ourselves. We can supply all the materials necessary or, if you prefer, fit a suite which you have purchased yourself. We will supply fully qualified electrical engineers to connect shower pumps and lights in a safe way, adhering to current regulations. If you have any questions or comments about our installation service for kitchens and bathrooms in Redditch and surrounds, please feel free to contact us.